Ernest Anastasio will serve only probation after successfully completing the Washington County Drug Court Program. 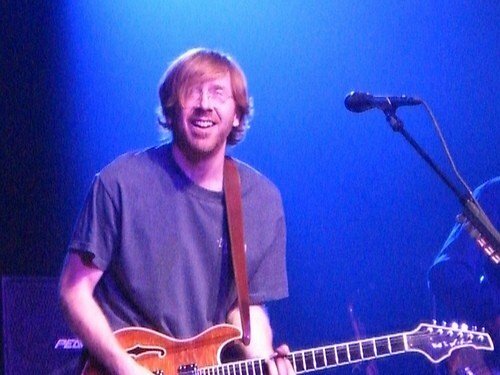 Ernest "Trey" Anastasio, the former lead singer of Phish, faced as many as 3 years in state prison following his 2006 felony drugs arrest. Instead, he received 3 years of probation only after he passed through the Washington County Drug Court Program, with "flying colors". Anastasio was caught in Whitehall in Dec 2006 with a collection of narcotic pain medications, none of which were prescribed to him – a class D felony. He was sentenced in Washington County Drug Court to community service, a year of drug testing and a lengthy treatment program. Washington County DA Kevin Kortright reported that the rocker did very well in treatment, and other than having had one small violation, was a model program participant. In County Court, Kortright recommended the reduced sentence for Anastasio and three other graduates of the drug court treatment program. Kortright had asked "Trey" to use his celebrity to help others and Anastasio did so while leading a class through the Road to Recovery program, a group that helps teens beat drugs and alcohol. Had Anastasio failed to complete the program, he was eligible for as many as 3 years in state prison. The terms of his probation have not been released, and they may require that Anastasio remain a resident of Washington County.